I’ve always appreciated Porsches and I’ve been lucky enough to own a few. This is one of my mate’s cars and it’s a little bit special because it’s one of just 14 that came to Australia. 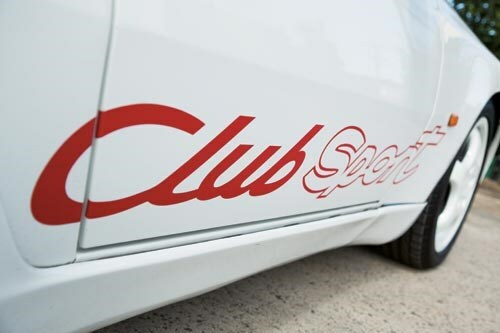 It’s a 968 Club Sport with an M030 option, a handling and brake package intended for track work. 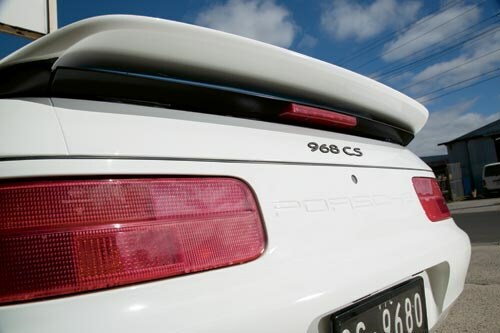 Over the years, Porsche has built a few cars like this; deleting various parts of the road car specification – like air conditioning and radios – that aren’t required for ultimate performance and adding improvements such as thicker anti-sway bars, stiffer springs and better brakes to make the cars more appealing and capable for track duties. Porsche started doing cars such as this back in the 1950s, with the 356 Speedster. It was the same ethos as this one: if you don’t need it, leave it out to make the car lighter and faster – and cheaper! The Speedster back then had a low, light windscreen frame that was removable, no wind-up windows and a very simple tonneau for a roof. 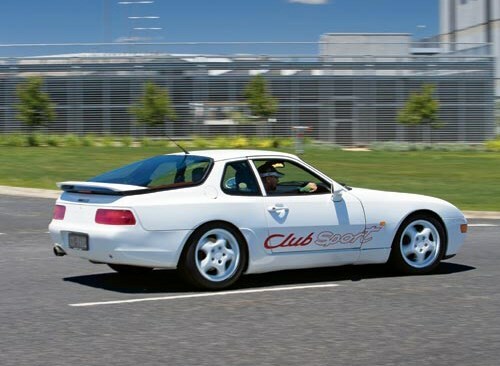 Like the Speedster, this 968 CS is basically a track car that is road registerable. 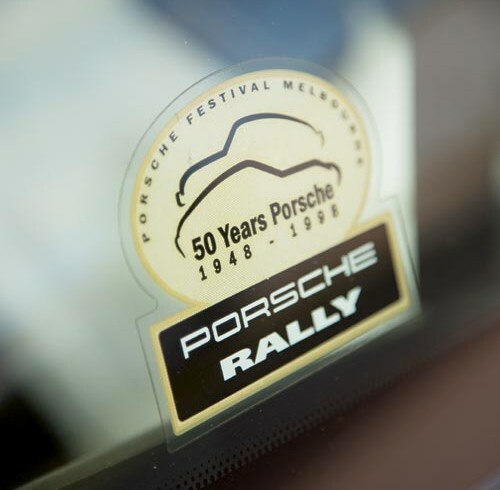 Porsche knows better than anyone that saved weight is free horsepower so the engineers even went to the trouble of installing thinner glass and a smaller battery. Losing weight is as important as increasing power. In fact it’s better, improving handling, braking and general behaviour – something that horsepower can’t always do! The weight saving on this car is around 100kg and let me tell you that on a track that is substantial. In recent times I’ve experienced that with my (racing) Mustang Sally and it really makes a difference. A lot! I like the styling; it’s an updated version of the basic body that was first seen on the 924 of the mid-1970s. 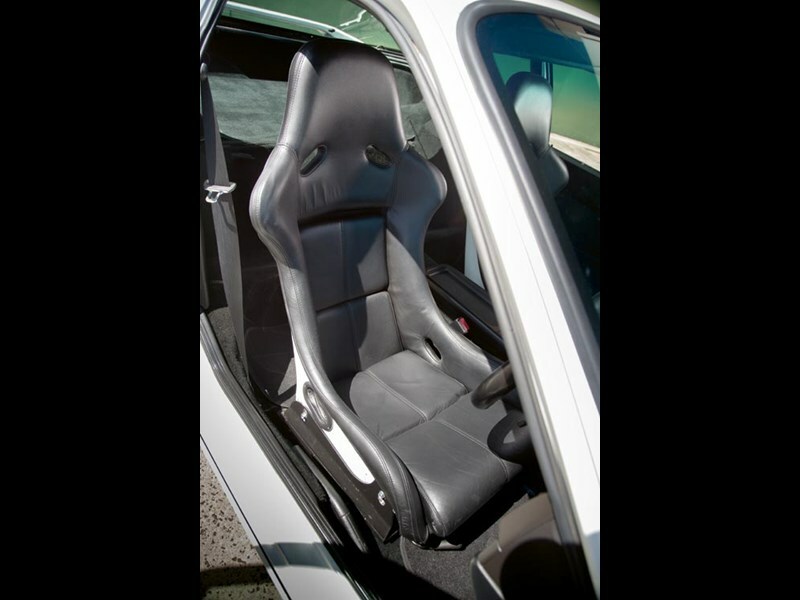 Inside, this one has Recaro Kevlar-backed shell seats and no rear accommodation to speak of. The rears of the seats are painted body colour so it has a bit of a technical or comp-ready appearance to it. 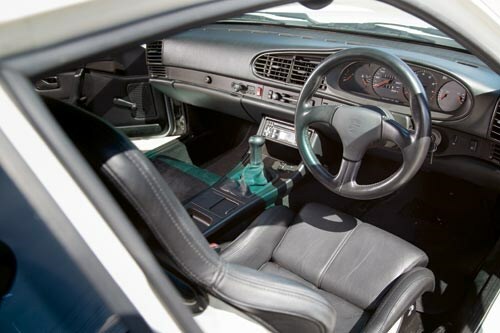 This one also has leather seat facings; I think this is the only one of the 14 Aussie cars so equipped. Getting in and out is a bit of a chore due to the deep track-type seats, but once you’re in there’s plenty of room – headroom, legroom, foot room – so I reckon if you’re a big character you won’t have any problems getting comfortable. 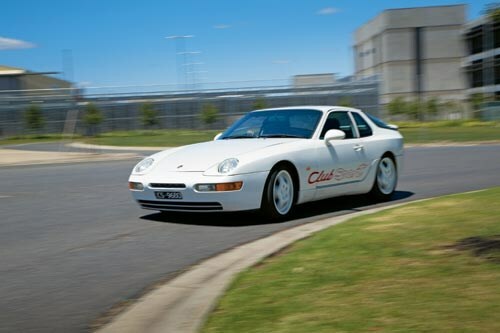 I’ve driven a few of these at various times – like at high performance track days – and with the engine at the front and the gearbox at the rear they are unquestionably the easiest Porsche to drive. They are neutral and beautifully balanced with great steering and a gorgeous gearbox. They are a beautiful handler and a fantastic motor car but the Porsche traditionalists – hooked on rear engine 911s – don’t get too excited about them! When I drove for the factory Mazda RX-7 team in the early-to-mid 1990s these Porsches were the cars to beat. Jim Richards and Peter Fitzgerald ran factory-supported 968 Club Sports with the M030 option and they were made for that sort of thing. But they are also a liveable road car – you could drive it to work a few days a week. If there is one criticism, it’s the fact that with track-oriented coil-over springs and adjustable dampers, the ride is fairly firm, but on reflection it’s not too bad – it’s not much worse that some later-model BMWs with the run-flat tyres. The engine is a bit special, too. It’s a 3.0-litre four-cylinder twin-cam four-valver with Porsche’s VarioCam and balance shafts. 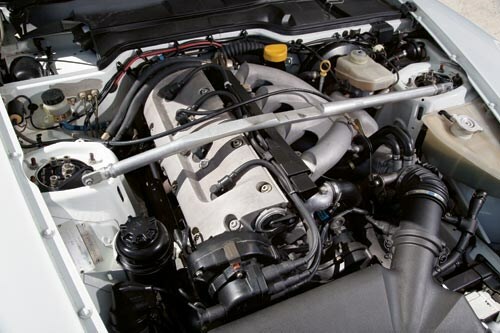 The balance shafts were licenced from Mitsubishi which had developed the technology for the big-capacity engine they used in the Sigma and Magna! I think Porsche decided it couldn’t do a better job of balancing its own big-capacity four so it ended up paying royalties to Mitsubishi. The VarioCam packs out the torque so it’s smooth, torquey as hell and with 0-100km/h acceleration in the sixes it’s a relatively quick car. The wheels are 17-inchers known as ‘Cups’ and unlike some of the other stuff from the 1990s (HSV tri-spokes anyone?) they remain a good looking wheel. These days 19s and 20s are standard fit for many performance cars but 17-inch was a reasonable size back then. And you know what? It means keeping good rubber under this isn’t too difficult or expensive, and they are lighter than larger wheels. The gearbox is a six-speed manual. It’s a transaxle with the gearbox installed at the rear of the car for better weight distribution. In fact, I think Porsche claimed 50:50 for the weight distribution. Of course it doesn’t make your nose bleed by today’s standards but it remains a good thing. But consider that it’s coming up to 20 years old and driving this still makes you smile. In that regard, it’s like only a few other cars – like a Mazda MX-5 – for delivering a genuinely fun, contemporary performance feeling for a car that is now getting on in years! I reckon in another 20 years’ time this will be worth good money. History shows us that people appreciate and value rare and capable factory-built hot-rods. And in the meantime, it’s a damn good drive. 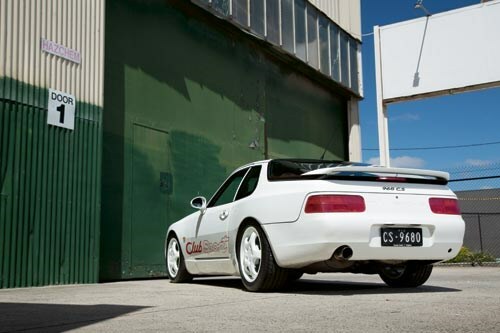 Chris Sparrow jangles the keys to this 968 CS. "John Bowe talked me into this – he convinced me to buy one because he said they’re the best thing since sliced bread!" laughs Chris, who has worked in the motoring game all his life. "But I don’t have time to drive it very often. Really, these things are a terrific drive. They’re as torquey and responsive as a V8. They’re not a supercar like, say, a GT3 but as an all-rounder – daily driver, weekend tourer and a fun track car – they’re hard to beat. Maintenance and servicing is not expensive, either."